Simon & Schuster, 9781451659207, 336pp. The story of the making of a classic and groundbreaking TV show, as experienced by its producers, writers, and cast. Forty years later, The Mary Tyler Moore Show is one of the most beloved and recognizable television shows of all time. It was an inspiration to a generation of women who wanted to have it all in an era when everything seemed possible. Jennifer Keishin Armstrong’s Mary and Lou and Rhoda and Ted tells the stories behind the making of this popular classic, introducing the groundbreaking female writers who lent real-life stories to their TV scripts; the men who created the indelible characters; the lone woman network executive who cast the legendary ensemble—and advocated for this provocative show—and the colorful cast of actors who made it all work. James L. Brooks, Grant Tinker, Allan Burns, Valerie Harper, Cloris Leachman, Betty White, Gavin MacLeod, Ed Asner, Ted Knight, Georgia Engel—they all came together to make a show that changed women’s lives and television itself. Mary and Lou and Rhoda and Ted is the tale of how they did it. "A rich chronicle of women making history." "Poor dead Chuckles the Clown might be squirting seltzer water down the angels’ robes, but as long as intelligent comedy has a role in our lives, the chuckles and change that “The Mary Tyler Moore Show” wrought will never die. And Armstrong, in this smart and charming history, shows us why." "This is a wonderful book. It takes us backstage with a keen insight on the writing, directing and casting of one of the best television shows, ever. I didn't want it to end, any more than I wanted The Mary Tyler Moore Show to end." "I tried to skim this book, but failed miserably, finding I couldn't put it down. In case you're wondering how we got from I Love Lucy to Girls, the answer is: "The Mary Tyler Moore Show, stupid!" Jennifer Keishin Armstrong's deft weave of social history and sharp entertainment reporting explains how this revolutionary show made the world safe for Lena Dunham." Mary and Lou and Rhoda and Ted hurt my face. Jennifer Armstrong brought back memories and laughs from one of the best eras in television. She made me stay up all night and by the morning my face hurt from smiling. I forgive her because I enjoyed the book so much. "Pop-culture gold: a can't-put-it-down history of The Mary Tyler Moore Show and the misfit genius women (and men) who made it. 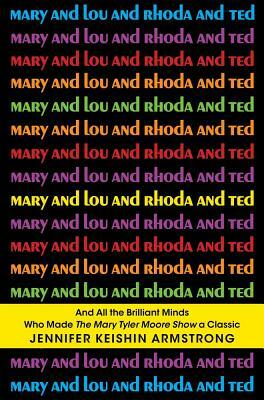 Mary and Lou and Rhoda and Ted is essential reading if you love The Mary Tyler Moore Show, or TV comedy wizards, or things that are awesome."